São Paulo-based curator Adriano Pedrosa curates an attempt to “infiltrate the hierarchies of the gallery system” by inviting any interested artists to submit works through an open submission process involving an interview and selection system that closed in February 2013. Featured artists include Slade graduate Martin John Callanan and Camberwell graduate Venisha Francis-Hickson. 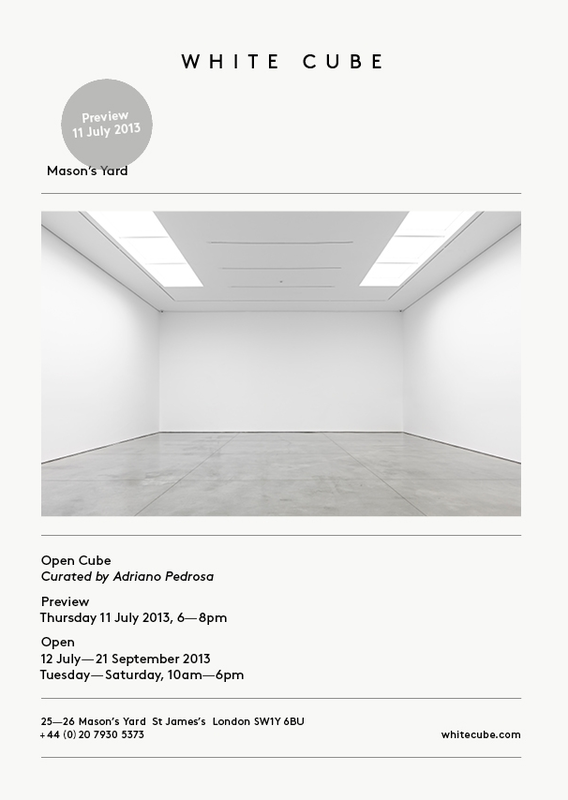 White Cube Mason’s Yard is pleased to present ‘Open Cube’, an international group exhibition organised by São Paulo-based curator Adriano Pedrosa. 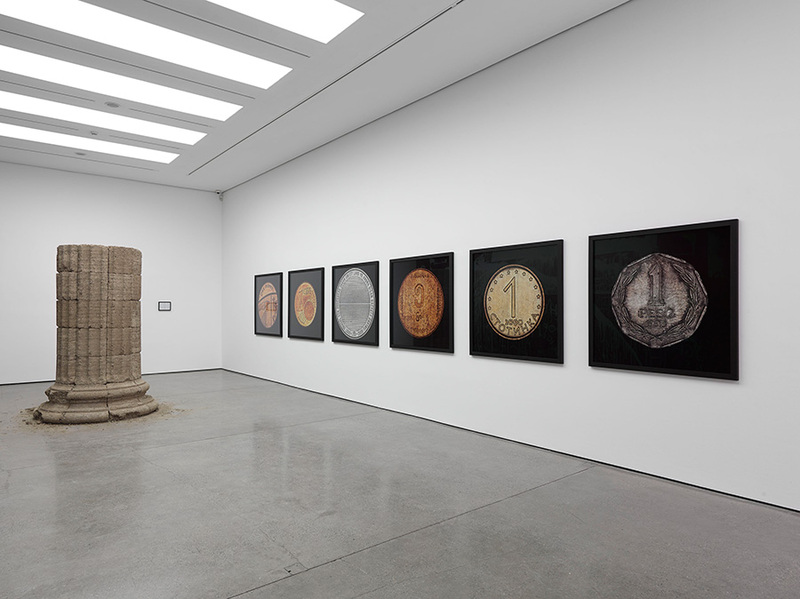 Invited by the gallery to curate an exhibition, Pedrosa launched a process of open submission via Art Agenda in January 2013, under the title ‘Call for entries: ‘Open Cube’ at White Cube Mason’s Yard’. The only requirement was that the artist needed to be available for an interview in London with the curator, in March 2013. ‘Open Cube’ received over 2,900 applicants, of which Pedrosa interviewed 38 and selected a final group of 17 artists. Taking his cue from Brian O’Doherty’s seminal book Inside the White Cube, the Ideology of the Gallery Space (1976), Pedrosa’s exhibition challenges the identity of White Cube as an organisation, as a physical space and as a concept, questioning the complex relationships between existent notions of ‘inside’ and ‘outside’, value and economics. By opening up the curatorial selection process beyond his own networks and meeting with artists who were previously unknown to him, Pedrosa confronts what he perceives to be the standard gallery practice of seemingly closed systems that exist in the criteria for staging exhibitions. 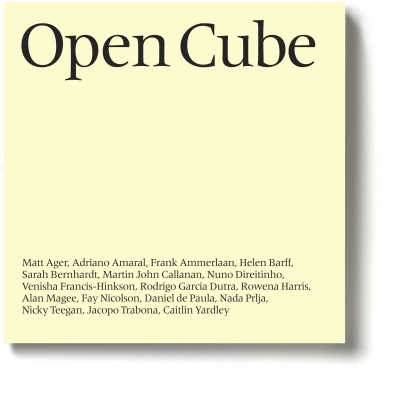 In the accompanying catalogue, which includes transcripts of the interviews Pedrosa conducted with the 17 selected artists, he suggests that the ‘Open Cube’ is a transparent cube and sets out to reveal what goes on behind the gallery doors. Pedrosa is himself interviewed by Pablo Leon de la Barra, in order to expose his own methods and the motivations behind this exhibition. The publication is fully illustrated and will be available in September 2013. Matt Ager was born in 1985 in England and lives and works in London. He recently completed a residency at Skowhegan School in Maine, USA and is currently part of the postgraduate programme at the Royal Academy Schools in London. Recent exhibitions include ‘Classic Poncho’, The China Shop, Oxford (2013); ‘A Nod’, Space in Between, London (2012); ‘OVERTHIN’, Gallery Primo Alonso, London (2011) and ‘DUMBO Arts Festival’, Brooklyn, USA (2010). Adriano Amaral was born in 1982 in Brazil and lives and works in London. He is currently studying for an MA in Sculpture at the Royal College of Art, London. 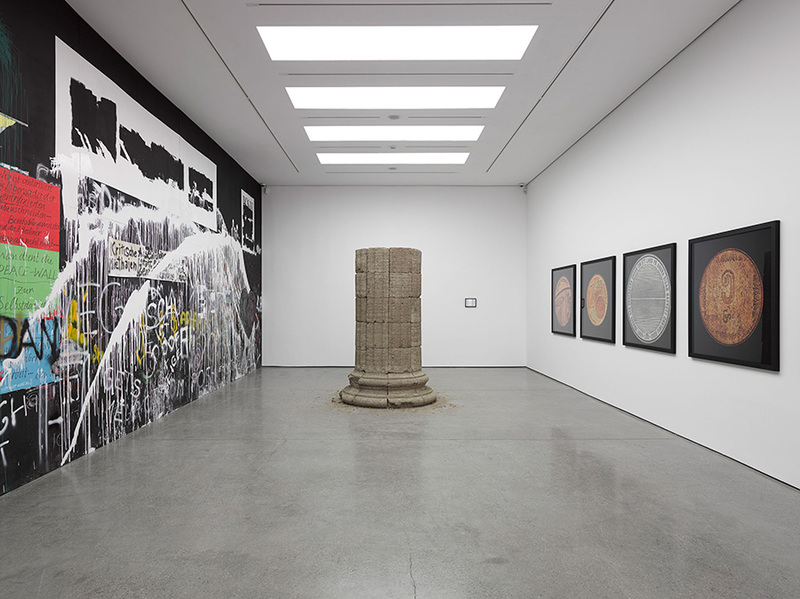 Recent exhibitions include ‘WIP Show’, Royal College of Art, London (2013); ‘Embaixo da Terra o Cèu de Novo’, Transversal Gallery, São Paulo (2012); ‘Solo Objects’, Arco Madrid (2012) and ‘Nova Escultura Brasileira’, Caixa Cultural, Rio de Janeiro (2011). Frank Ammerlaan was born in 1979 in Sassenheim, The Netherlands and lives and works in London. He holds a BA in Fine Art from Gerrit Rietveld Art Academy, Amsterdam and an MFA in Painting from the Royal College of Art, London (2012). Awards include the Land Securities studio award, Degree Show, Royal College of Art (2012), a residency at the Museum of Contemporary Art, Calasetta, Italy (2013) and the Royal Award of Painting, The Netherlands (2012). Recent exhibitions include ‘Painting without Paint’, David Risley Gallery, Copenhagen (2012); ‘Day’s End’, Upstream Gallery, Amsterdam and ‘Stereopsis’, The Drawing Room, London (2012). Helen Barff was born in 1974 in England and lives and works in London. She holds a BA (Hons) in Fine Art and Art History from Goldsmiths College, London (1999) and an MA in Drawing from Camberwell College of Arts, London. Residencies include Greatmore Studios, Cape Town and Gasworks Gallery/The Triangle Arts Trust, London (2008).Recent exhibitions include ‘Brood’, Bend in the River, Gainsborough (2011); ‘Things from the Thames’, Bearspace, London (2005); ‘Trident Way’, Departure Gallery, London (2010). Site-specific projects include ‘Route 12:36’, South London Gallery: Artwork on bus routes 12 and 36, London (2000). Sarah Bernhardt was born in 1989 in Canterbury, UK and lives and works in London. She received a BA in Fine Art at Central Saint Martins. Recent exhibitions include ‘Co-Respondent’, Transition Gallery, London (2013) and ‘The Sand Between God’s Toes’, Pie Factory, Margate (2012). Martin John Callanan was born in 1982 in the UK and lives and works in London. He holds an MFA from The Slade School of Fine Art, University College London (2005) and is currently a Teaching Fellow in Fine Art Media at the Slade School of Fine Art, University College London. Recent exhibitions include ‘Along Some Sympathetic Lines’, Or Gallery, Berlin (2013); Whitstable Biennale (2012); Horrach Moya Gallery, Palma (2012) and ‘Deed Poll’, a performance at Whitechapel Gallery, London (2012). Nuno Direitinho was born in 1981 in Portugal and lives and works in London. He holds a BA in Fine Art Photography from the Glasgow School of Art (2011) and is currently doing his MFA in Fine Art Media at the Slade School of Fine Art, University College London. Recent exhibitions include ‘Voies Off’, La Galerie a Ciel Ouvert, Arles, France (2012); ‘Emergents DST’, Teatro Circo de Braga, Portugal (2011) and ‘3+1’, Assembly Gallery, Glasgow (2011). Venisha Francis-Hinkson was born in 1989 in England and lives and works in London. She holds a BTEC National Diploma in Art and Design from St. Francis Xavier College (2009) and a BA (Hons) in Drawing from Camberwell College of Arts (2012). Recent exhibitions include ‘Future Map 12’, CSM Lethaby & Window Galleries, London (2013); The Learning Resource Centre, Camberwell College of Arts (2012) and ‘Peek Show’, The Biscuit Factory, London (2011). Rodrigo Garcia Dutra was born in 1981 in Rio de Janeiro, Brazil and lives and works in London. He holds an MA Fine Art from Central Saint Martin’s School of Art and Design, London (2009) and is currently studying for an MA in Sculpture from the Royal College of Art, London (2014). Awards include Fundacão Bienal de São Paulo, Programa Brasil Arte Contemporanea. Recent exhibitions include ‘Notes to Self’, Royal College of Art, London (2013); ‘Outras Coisas Visiveis Sobre Papel’, Galerie Leme, São Paulo (2012); ‘Theory of a City or the Possibilities of an A4′, ISCP, New York City (2011) and ’17 Ingredients: Measures of Autonomy’, BASH Studios, London (2009). Rowena Harris was born in 1985 in Norfolk and lives and works in London. She holds an MFA in Art Practice from Goldsmiths College, London (2010) and a BA in Fine Art from University College Falmouth, UK (2008). She is the founder and editor of a bi-annual art publication called ‘Misery Connoisseur Magazine’. Recent exhibitions include ‘Cold Compress’, Drei Gallery, Cologne (2012); ‘No More Icons’, Rod Barton Gallery, London (2012); ‘Believing in Things’, Van Horbourg Gallery, Basel (2011); ‘New Contemporaries’, ICA, London and The A Foundation, Liverpool (2010). Alan Magee was born in 1979 in Ireland and lives and works in London. He holds an MA in Fine Art from Central Saint Martin’s College of Art and Design. Awards include Florence Trust Studio Residency, Arts Council of Ireland and Travel and Mobility Award. Recent exhibitions include ‘Endogenous’, Maria Stenfors Gallery, London (2012); ‘Agents of change’, Studio 1.1, London (2012) and ‘Our Lives as Things’, Occupy Space, Limerick, Ireland (2011). Fay Nicolson was born in 1984 in Derby, UK and lives and works in London. She holds a BA in Fine Art from Central Saint Martin’s College of Art and Design, London (2006) and an MFA in Fine Art from the Royal College of Art, London (2011). Recent solo exhibitions include ‘Work with Material’, Künstlerhaus Wien, Vienna (2013) and ‘Bad Signs’, PLAZAPLAZA, London (2012). Group exhibitions include ‘A Small Hiccup’, Grand Union, Birmingham (2013); ‘Take Me Out’, Limoncello Art Projects, The London Art Fair (2013) and ‘Manifesta 8’, Murcia, Spain (2010). Daniel de Paula was born in 1987 in Boston, USA and lives and works between Itapevi, São Paulo and Paris. 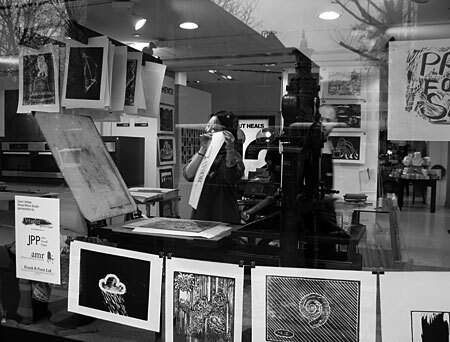 Recent exhibitions and residencies include ‘Espaáos Independents ñ a alma è o segredo do Ègocioí’, Galerias Funarte de Artes Visuais, São Paulo (2013), Citè Internationale des Arts Residency, Paris (2013) and ‘Da prûxima vez eu fazia tudo diferenteí’, Pivù, São Paulo (2012). Nada Prlja was born in Sarajevo, Bosnia and Herzegovina and lives and works in London. She holds a degree from the Academy of Fine Arts in Skopje, Macedonia and an MPhil research degree from the Royal College of Art, London. Recent exhibitions include the ‘7th Berlin Biennale’ (2012); Manifesta 8, Murcia, Spain (2010) and International Biennial of Graphic Arts, Ljubljana (2009). Recent public presentations include Nottingham Contemporary, UK (2013); ICA, London (2011) and Tate Britain (2009). Nicky Teegan was born in 1987 in Ireland and lives and works in London. She holds a BA in Visual Arts Practice from IADT, Dublin (2009) and an MA in Fine art from Chelsea College of Art and Design, London (2012). She is a founding member of Ormond Studios, Dublin. Recent exhibitions include ‘MA Fine Art Show 2012’, Chelsea College of Art and Design, London (2012); ‘SWITCH/OVER’, Wimbledon Space, Wimbledon College of Art, London (2012) and ‘Invite or Reject’, Chicago Loop Alliance, Chicago, USA (2011). Jacopo Trabona was born in 1989 in Italy and lives and works in London. He graduates this year with an MA from Chelsea College of Art, London. Recent exhibitions include RIVAlutACTION, Riva Lofts, Florence (2012); ‘B x H x Me’, A + A Gallery, Venice (2012); ’95 Young Talents Collective’, Bevilacqua La Masa Foundation, Venice (2011) and Cava delle Rosselle, Grosseto, Italy (2011). Caitlin Yardley was born in 1984 in Australia and lives and works in London. She received an MA from Edith Cowan University, Perth, Australia (2007) and an MFA from Goldsmiths, University London (2012). Recent exhibitions include ‘Changing direction after entering at an angle’, Goldsmiths, University of London (2012); ‘Peripheral Orbit’, Acme, International Residency Studio, London and ‘An Intimate Distance’, Venn Gallery Project Space, Perth, Australia (2011). Adriano Pedrosa is an independent curator, editor and writer currently based in São Paulo. He has curated numerous international exhibitions and was adjunct curator of the 24th Bienal de São Paulo (1998) with chief curator Paulo Herkenhoff, co-curator of the 27th Bienal de São Paulo (2006) with chief curator Lisette Lagnado and co-curator of the 12th Istanbul Biennial (2011) with Jens Hoffmann. He has published extensively on contemporary art in numerous catalogues and magazines and is the founding director of PIESP-Programa Independente da Escola São Paulo. 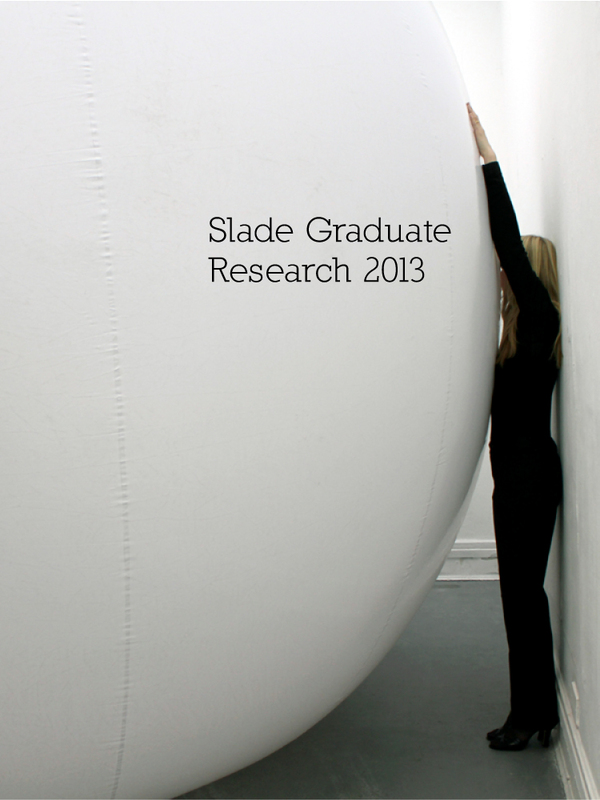 Design and edit ebook Slade Graduate Research 2013 for Slade School of Fine Art. 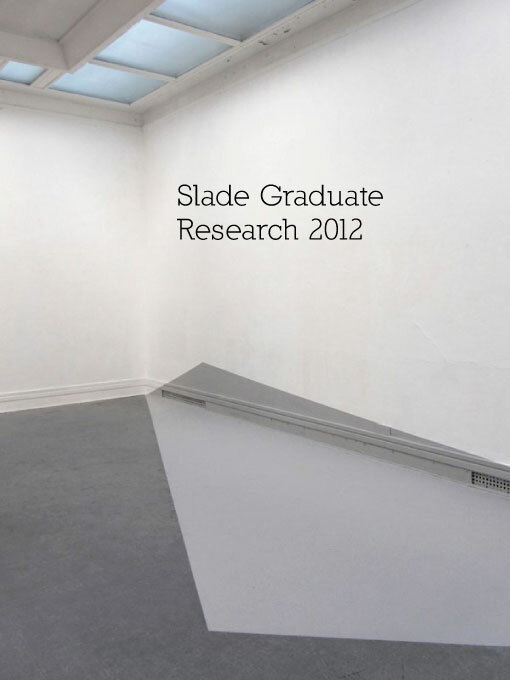 Design and edit ebook Slade Graduate Research 2012 for Slade School of Fine Art. All technology must move toward the way things were before humanity began changing them: identification with nature in the manner of operation, complete mystery. Art, once so elegant, has been transformed by representation into an object, cluttered and confused not only by operating systems and applications, its once-accepted inherited discourse, but by the words and the theories used to prescribe its very being. These prescriptions are themselves shrouded in a language that, disconnected from the world as it is, is no longer useful. To recapture that connection, it is necessary to find and use a tool that will leave no traces, that, in other words, will allow an unmediated relationship with the thing in itself. The problem is more serious: we must dispense with computers altogether and get used to working with tools. It can be put this way too: find ways of using computers as though they were tools, i.e., so that they leave no traces. That’s precisely what our computers, video cameras, amplifiers, web-servers, projectors, cameras, mobile phones, etc., and even the internet, are: things to be used which don’t necessarily determine the nature of what is done. Nowadays everything happens at once and our souls are conveniently electronic. © 2007-2019 Martin John Callanan (notes).